MongoDB is an open-source document database, and the leading NoSQL database. Using the Azure Management Portal, we can create a virtual machine running CentOS Linux from the image library, than we can install and configure a database MongoDB data on the virtual machine. Select and install 3 CentOS Linux virtual machine from the library using the management portal making two vms as the replica vms. 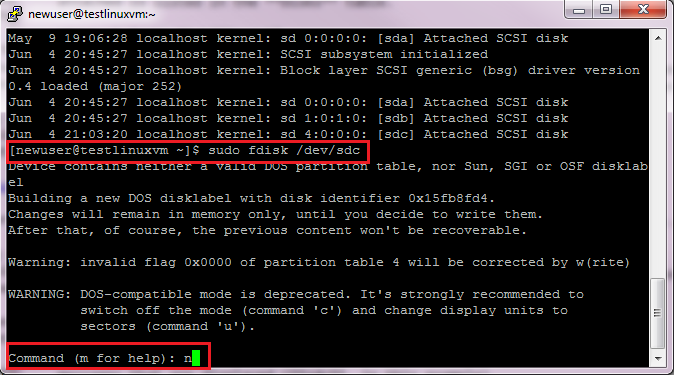 Assign a virtual hard disk (VHD) to all the vms . Install MongoDB on the virtual machine. Connect to mongodb and its replica sets. Before we start lets clear our concept on why we need Mongodb Replication on the first place. A replica set in MongoDB is a group of MongoDB processes that maintain the same data set. Replica sets provide redundancy and high availability, and are the basis for all production deployments. Replica Set Primary – The primary is the only member of a replica set that accepts write operations. Replica Set Secondary Members- Secondary members replicate the primary’s data set and accept read operations. If the set has no primary, a secondary can become primary. Set Up Affinity Group: Affinity groups are a way you can group your cloud services by proximity to each other in the Azure data center in order to achieve optimal performance. When you create an affinity group, it lets Azure know to keep all of the services that belong to your affinity group as physically close to each other as possible. 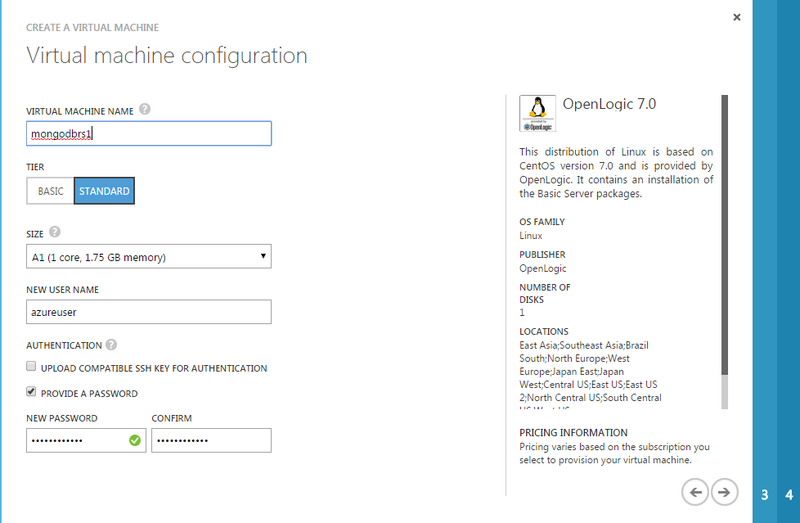 To create affinity group login to https://manage.windowsazure.com than go to settings and add new affinity group. In the Management Portal, in the lower left corner of the Web page, click + New on Virtual Machine, and then click From Gallery. Select a virtual machine image from CentOS Platform Images and click the next arrow in the lower right corner of the page. A similar process to creating instance 1. A similar process for creating instance 2. Choose “mongodbrs3” to be the Virtual Machine Name in step 3. Ensure “Add endpoint” is selected and click the right arrow to go to the next screen. The instance now should have 2 endpoints, 1 for SSH and 1 for MongoDB. Once the virtual machine deployed and endpoints configured, you can connect to it using SSH or PuTTY. If you use a Windows computer, connect to the virtual machine using PuTTY, which you can download from the download page of PuTTY. Download and save putty.exe on your computer. Open a command prompt, navigate to that folder and run putty.exe. Re-enter the password. Wait for the installation of updates. Imp – When connecting to instances 2 and 3, remember to use ports 23 and 24 and not the default ssh port of 22. 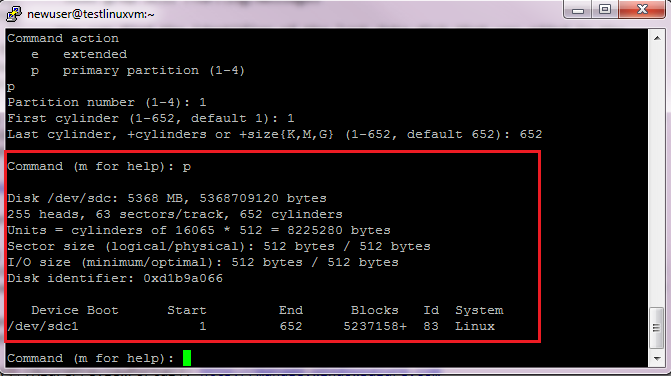 Initialize the data disk by following the steps described at How to: Initialize a new data disk in Linux. Once added, the data disk that you just attach to the virtual machine is offline and is not initialized. You must log in to the machine, and set the disc to use for data storage. 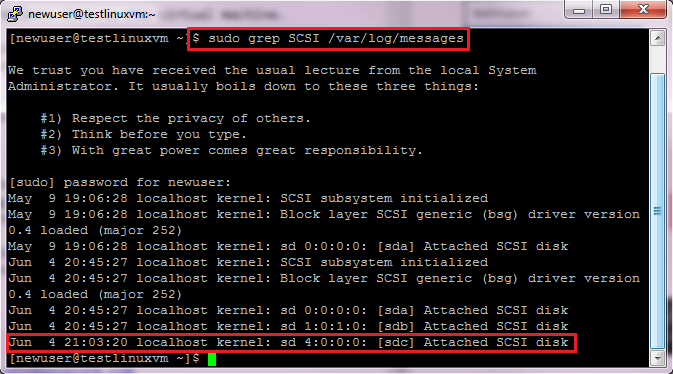 Once the virtual machine deployed, log on as newuser (as described in the previous steps) using SSH or PuTTY. The identifier of the last record added data is available in the messages displayed (ndc, in this example). Enter n to create a partition. Type p to set the partition as a primary partition, type 1 to set it as the first partition, and then press Enter to accept the default (1) of the cylinder. 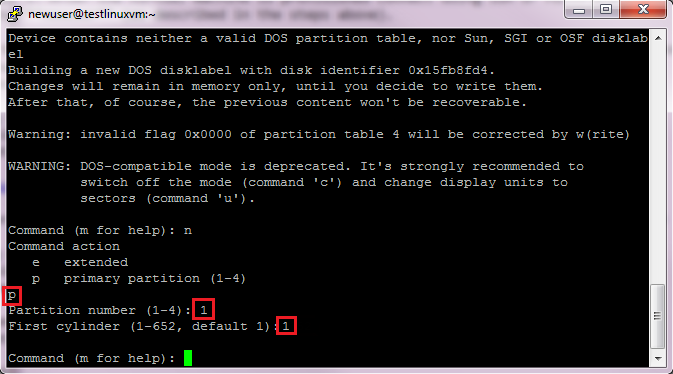 Type p to display the details of the disk covered by the partition. Type w to write the disk parameters. The data disk is now ready to be used as / datadrive. Caution: If you incorrectly modify the / etc / fstab file, it may be that the system can not boot. If in doubt, refer to the documentation of the distribution for information on appropriate changes to this file. It is also strongly recommended to create a backup of the file / etc / fstab before editing. If data drives or additional partitions are created, you must also be added separately to the / etc / fstab. When this command completes, you have successfully installed MongoDB. At this point in time, you should have mongod running on all 3 of your instances. You can now configure the 3 instances as a replica set by connecting to 1 of the 3 instances from within Azure or from outside. Fix – To fix this error edit the /etc/mongos.conf file and set your bind_ip = 0.0.0.0 in order to make connections externally from other servers. Better to comment out bind_ip. Why NoSql MongoDB must be Preferred over Others Databases?